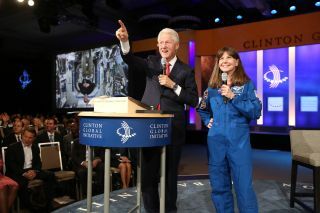 Astronauts talked with former President Clinton from aboard the International Space Station about the importance of working in space.Astronauts talked with former President Clinton from aboard the International Space Station about the importance of working in space. NEW YORK — Astronauts paid a virtual visit to former President Bill Clinton from the International Space Station on Wednesday (Sept. 24) to share their perspectives on Earth as it appears from their orbital home. NASA astronaut Reid Wiseman and European Space Agency astronaut Alexander Gerst, part of the station's current Expedition 41 crew, beamed down by video to the Clinton Global Initiative, a gathering world leaders here aiming to develop solutions to major world problems. Joining Clinton on Earth was NASA astronaut Cady Coleman, who visited the station during its Expedition 26/27 mission. "I want everyone to know what a unique and amazing place we have here [on the station]," Wiseman told Clinton and the conference audience. Aboard the station, the astronauts are engaged in experiments on the effects of life in zero gravity. For example, the progressive bone disease osteoporosis proceeds 10 times faster in a typical astronaut in space than it does in a 70-year-old woman on Earth, Coleman said. By measuring the physiological changes that happen to astronauts, scientists can study the effects of aging in space. The space station also provides a unique vantage point from which to view and appreciate Earth, the astronauts said. "There are no words to describe that first glance when you look back on your planet," Wiseman said. Earth is a "beautiful living organism," he added. With astronauts from United States, Russia, Brazil, Canada and Japan, as well as members of the European Space Agency, the space station is an exercise in global collaboration. When you're up in space, "it's hard to feel you're from any particular country," Coleman said. As operators of the ISS, Wiseman and his colleagues have become good friends, he said. "We want to get the job done, and we want to have fun doing it," he said. In response, Clinton joked that maybe the best way to get rid of the political gridlock in the U.S. Congress may be to send politicians to space. Last week, NASA awarded contracts to The Boeing Company and SpaceX to transport U.S. crews to and from the space station. NASA aims to end the United States' reliance on Russia for space transportation in 2017. People can argue about what the priorities in space ought to be, but they can't argue that humanity ought to go there, Clinton said. "If we're going places as a planet, I think we'll have to take the trip together," he said.